If you can't find what you are looking for, or no availability exists for your dates, please visit our sister website, www.cambridgebedbreakfasts.co.uk, where you can see our range of bed and breakfasts and hotels in Cambridge. Cambridge, home to one of the UK's most historic universities founded in 1209, is a quaint city filled with various historic universities colleges and full of museums. 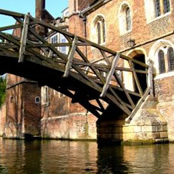 The historic city is also home to beautiful views from the Back's, areas of river banks owned by the colleges which provide a beautiful view that can also be seen from the many bridges that are used to access these areas. Cambridge University library is home to 6 month exhibitions and over 7000 books. The university is also home to historic buildings with varying architecture from the many eras in which they were built. The Botanic garden, opened in 1846 to the public, is home to over 8,000 varieties of plants. The city also plays host to many museums, such as the museum of technology, the Fitzwilliam museum (opened in 1842), the Scott polar research institute which tells tales of explorations and research into both the Arctic and Antarctic. The museum of zoology holds many of Charles Darwin's specimens. The Bucks, owned by the colleges, offers views of the river as well as access to the many bridges and kettles yard is a unique gallery home to a variety of contemporary art. National Express operates coach services to Cambridge from major towns & cities throughout the U.K. There are frequent coach services from both Central London, and London Stansted Airport through to the city. The main bus operator is Stagecoach. There is a fast and frequent rail service from London King’s Cross & London Liverpool Street through to Cambridge. There are also connections from Scotland & the North via Peterborough, and regional services from Birmingham & the Midlands, East Anglia & the Northwest. Cambridge is within easy reach of London Heathrow, London Gatwick & Birmingham International Airport. London Stansted is the nearest international airport to Cambridge, located just 30 miles to the South of the city, with easy access by train, coach, or car via the M11. Settlements have existed around the Cambridge area since before the Roman Empire. The first major development of the area began with the Roman invasion of Britain in about AD 40. Castle Hill made Cambridge a useful place for a military outpost from which to defend the River Cam. The settlement remained a regional centre during the 350 years after the Roman occupation, until about AD 400. After the Romans had left Saxons took over the land on and around Castle Hill and renamed it Grantabrycge – 'Bridge over Granta'. The arrival of the Vikings in Cambridge was recorded in the Anglo-Saxon Chronicle in 875. Viking rule, the Danelaw, had been imposed by 878. The Vikings' vigorous trading habits caused Cambridge to grow rapidly. In 1068, two years after his conquest of England, William of Normandy built a castle on Castle Hill. In 1209, students escaping from hostile townspeople in Oxford fled to Cambridge and formed a university there. The oldest college that still exists, Peterhouse, was founded in 1284. 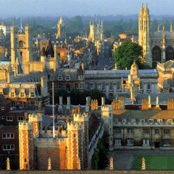 One of the most well-known buildings in Cambridge, King's College Chapel, was begun in 1446 by King Henry VI. The project was completed in 1515 during the reign of King Henry VIII. During World War II Cambridge served as an evacuation centre for over 7,000 people from London, as well as for parts of the University of London. The town became a military centre, with an R.A.F. training centre and the regional headquarters for Norfolk, Suffolk, Essex, Cambridgeshire, Huntingdonshire, Hertfordshire, and Bedfordshire established during the conflict.